Algreen's Versatile magnetic drive pumps are ideal for any job. These energy efficient pumps are U.L listed with a 1 year warranty. Perfect for Hydroponics and very Large Fountains. Algreen's Versatile 850GPH magnetic drive pump is for underwater use and is ideal for any job. These energy efficient pumps are U.L listed with a 1 year warranty. Perfect for Ponds, Waterfalls and Streams. 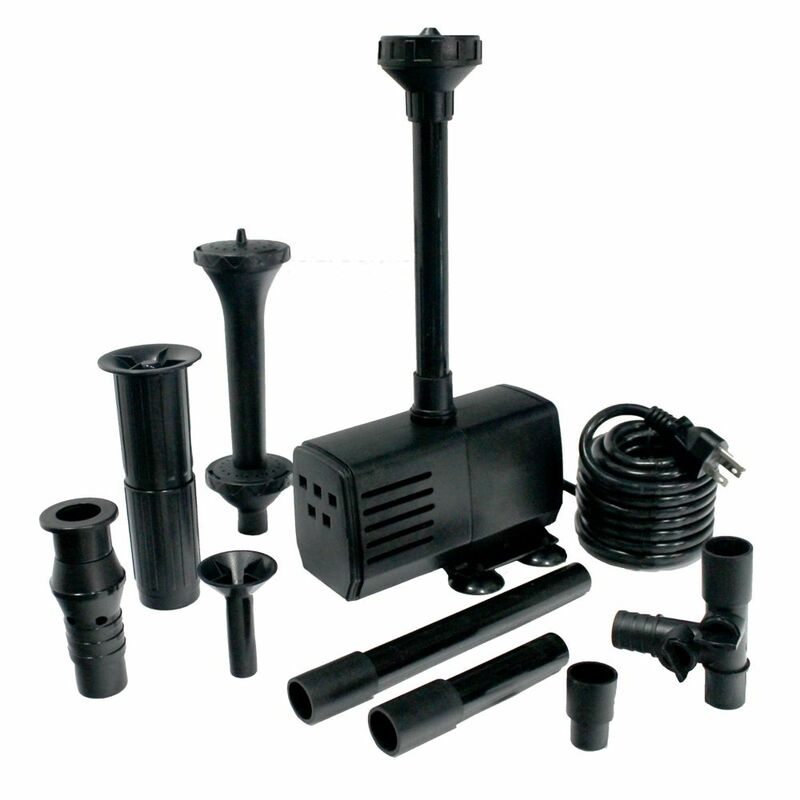 This 50 GPH Solar Pump is most suitable for fountain and pond use, and includes a spray nozzle with five unique spraying features. The pump also offers a battery backup that allows for up to 4 hours operation without any sunlight. The battery can be charged by the solar panel or conventional electrical plug, and integrated LED lighting is also included. 500 GPH Pond Pump with Fountain Nozzles Reliable, powerful and efficient; Ideal for use in medium to large sized ponds (Up to 750 Gallons). Kit includes: 500 GPH energy efficient pump, pre-filter, 3/4" output, diverter with dual flow control, 3 extension tubes with coupler, 5 spray nozzles: Bell, Foaming Jet, Tiered, Double Tiered and Trumpet. 500 GPH Pond Pump with Fountain Nozzles is rated 3.0 out of 5 by 2. Rated 5 out of 5 by JDoyle from Fantastic for what I needed If you're using this all the time, get the prefilter as well. This is an excellent product, nothing else came close to what I was looking for. Nice options for nozzles, all are unique and wonderful. I'm extremely happy with this product for our needs. Rated 1 out of 5 by Berenpalantir from Terrible Bought this for my 700 gallon pond. There's no way to hold it so that it nicely rests flat on the bottom. Hold it by any attachments and they pop off. Hold it by the filter side and that immediately detaches. You can hold it by the motor side but you would need to be in the pond and able to set it on the bottom. I tried to use the diverter to attach a hose for my waterfall. There wasn't enough force to allow more than a dribble to come from the hose, even when I closed the diverter on the fountain part.